April has arrived and with it many National Pet Holidays and Observances and I am going to focus on one in this blog which I think is just as important as the others but the main reason I am focusing on this one is that Spring has arrived, summer is around the corner and that means we are outdoors more, hiking, camping plus many more adventures. When we pack for those adventures one of the important items that some of us forget about is the First Aid Kit for our Pet, we remember for us and remember many items for the pet but this is one that we forget. It happens cos we are humans LOL. What should a First Aid Kit have, we can either build our own or buy one that is prepared already, I personally have put my own together as it was easier plus it is easier for me to keep an eye on the expiry dates and some of the over the counter ones come with food, etc which I do not need. I also have in my kit some Topical Relief – 4Paws Pet Balm by Restorative Botanicals. which works wonders on bites, as it relieves the itchiness plus if she licks it it has Hemp Oil in which calms her down. See link below for the product. I have made sure our first aid kit is not that heavy so that it makes it easy for me to take when I am out for the day on an adventure with Layla. This kit with of course other items I keep in my earthquake emergency bag and take out when needed so it makes my life easier and I am more relaxed. I also keep with my kit the book : Dr. Pitcairn’s Complete Guide which is my Bible for everything. 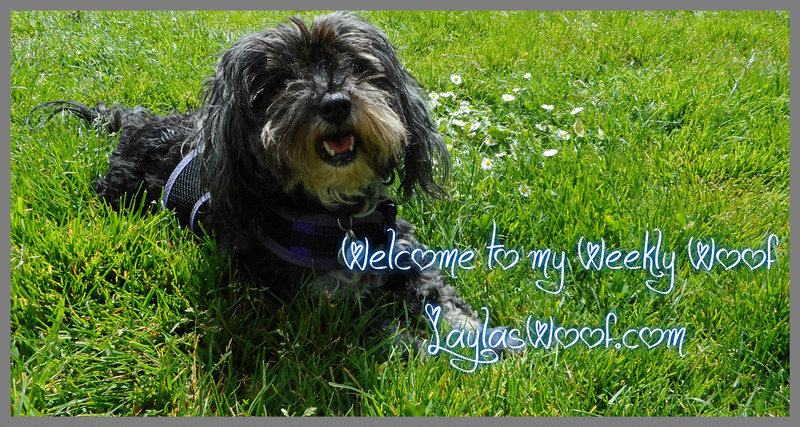 I do admit I am a Jewish Mom so am always worried about Layla when we go to different dog parks or other outdoor activities and that is the reason LOL that I am reminding all of us. 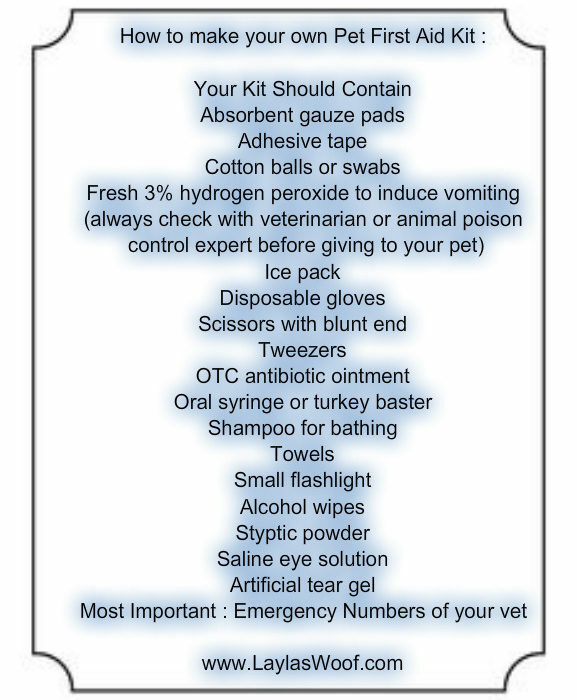 Do you have a first aid kit for your pet ? What do you have in yours ? We are so looking forward to the summer, spending time outdoors and having fun which is so needed after all the rains. This entry was posted in Rescued Dog and tagged #adventures, #dogparks, #dogs, #fisrtaid, #nationalpetfirstaidmonth, #pets, #petsafey, #summer by admin. Bookmark the permalink. Great reminder and thanks for including that list! I must admit I don’t have a first aid kit per se. I do have products in my bathroom and the dog cupboard, but not items dedicated to pet care in one bag. You got me thinking I should put some basics in a dedicated dog bag, so when we’re off on an adventure with Jack I don’t have to worry if there is a pharmacy or pet supply store nearby. Great post! At our house we have one big first aid kit that’s for both people and pets. We go hiking a lot so we are working on another kit to keep in our car too. It’s awesome to have first aid supplies on hand when you need them. Michelle that is awesome and I agree with you it is so important to be prepared G-d Forbid than not have anything is a crisis arrives. A Pet First Aid Kit. Why didn’t I think of that? I like your complete list of items. Very good reminder. My kids finally passed the diaper bag stage, so now, I guess I could carry a dog emergency bag with us when we go to the park or for a long hike. Great Article. I have a first aid kit in my groomers bag that lives in my car. And a small one in Plush’s carrybag. I need to do some revamping of that one now that he’s going out more. I always keep a muzzle, bite gloves and a spare carrier in my car too. We have a first aid kit that we take when we travel as well as a tiny one when we walk in our neighborhood. I am really excited about the book I just reviewed: Symptoms To Watch Out for In Your Dog, as it points out a lot of symptoms that might be overlooked AND has a way of letting you figure out if it is an emergency or something that can wait. It is perfect for the worrying dog mom! That is great that you are prepared and books can give us so much info also. A first aid kit is important, especially if you walk a dog and maybe cut a paw or need paw balm for softening in hot weather. This is a great list of ‘must have’s’ and includes some I would have forgotten! Our first-aid kit expanded a lot over the years. We started with the basics and ended up adding stuff over time. For our large dogs, that also includes a support harness in case they couldn’t ambulate on their own and all sorts of things. I don’t have a first aid kit put together yet, but this is a great post to give me ideas of what I may need. Absolutely a great post! So important to share reminders about Pet First Aid and First Aid Kits! We do have one, for many, many years. Ours in a big, red duffel bag. My kit has always included items for Canine Epilepsy as well, which I share with my readers, since one of my Huskies was an Epidog. And, in addition to standard First Items, also – especially now that the summer weather is here, Benadryl in case of bee stings. Everyone should have a First Kit at the ready (and one for the car, too)! Great they have this as a reference. Here’s to a happy, healthy, and incident-free summer to all (so we don’t have to use very important First Aid Kits)!